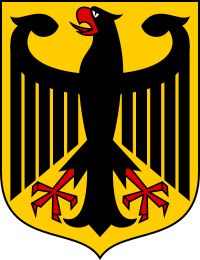 The Coat o airms o Germany is a sign o Germany; the coat o airms features an eagle. The colours o the coat o airms are seemilar tae those o the Banner o Germany (black, red an gowd). Thegither wi the coat o airms o Austrick, which haes the same history, it is the auldest extant state seembols o Europe an is amang the auldest insignie in the warld. Wikimedia Commons haes media relatit tae Coats of arms of Germany. This page wis last eeditit on 3 Mairch 2018, at 19:42.